Monday morning is always an excellent time for a giveaway! This morning thanks to the generous folks at Berroco we’re giving away a yarn pack of Istex Plötulopi to make Amy Christoffers divine sweater Glaswegian in the brand new Deep Fall Knitty! Plötulopi is lighter than air and knits up at a 5-ish stitches to an inch gauge. That gauge combined with an Icelandic style makes for a lickity-split-quick knitting sweater, perfect for kicking off fall knitting. Glaswegian is one of those perfect sweater that will never get put away all fall and winter because you’ll wear it nearly everyday. Ready to enter? Just leave a comment below between now and Sunday! Our usual giveaway rules apply. Leave a comment on this post between now and 11:59 pm eastern time, Sunday October 1, 2017. One comment will be chosen at random to answer a skill testing question. If the commenter answers correctly they will win a a yarn pack from Berroco of Istex Plötulopi to make Glaswegian in the size of their choosing. Value of contest $47.50-$66.50 USD. This is one of my Deep Fall favorites. Good luck everyone!! Beautiful cardigan! It would be wonderful to win the yarn to knit it! Nifty-neat-o! That’s one of my favorite patterns from this issue. I’d love the yarn to knit it! Beautiful cardigan. I would love to make it. Pretty pattern and colors. Thanks for the giveaway. Keeping my fingers crossed! What a wonderful contest! Gorgeous sweater! I would love to make this great cardigan and am very interested in trying the unspun icelandic yarn! What a wonderful sweater design and would like to try the yarn also. Beautiful cardigan. Thank you for the opportunity to win the yarn. I just learned how to steek and I might just turn all my sweaters into cardigans. It’s too hot in NoVa for a pullover wool sweater. This would make a great jacket. I would love to make this beautiful sweater! I think I would live in it all winter! This sweater really caught my eye…and I love Plotulopi, I’ve knit 3 sweaters in it…and would love to have more…and more colors! What a great sweater and fabulous giveaway. It’s starting to get crisp, so the perfect time to think about fall knitting. This sweater is beautiful! And the colors are in my palette! Fingers crossed. What a gorgeous sweater! I love Plötulopi…. so light and airy and warm! How beautiful to go from skirts to jeans. The perfect compliment to most any outfit. That is gorgeous! Fingers crossed! That would make choosing yarn colors a lot easier! This couldn’t be more beautiful AND perfect for the cold weather coming up too soon! This pattern is adorable – and I’d love to try icelandic yarn. Totally my style of sweater! I’ve made several Icelandics, and would love a new one! Oh, Lovely! and I need a project. I’ve been sighing over this cardigan since last week even though it’s in the 90’s here today. I would love to expand my color work abilities with this. I absolutely love this cardigan. I haven’t done any colorwork for years and am itching to give it a try again and this would be the perfect beginning project. This was my favourite from this issue. Also my favourite colours. Coudn’t miss. This is such a beautiful and versatile sweater! The sweater is beautiful, I would love to knit it. I’m a Lopi pattern junkie & hands down, this is my favorite sweater in the new issue! It would awesome to win the kit for it. This pattern, in these colors, makes me so happy! Beautiful sweater. Thanks for giving us a chance to win it! I’ve never esteemed before, this looks like a great sweater to try this technique! Never tried an Icelandic style sweater yet! Thanks for contests. I am loving colour work this year! I’ve always wanted to try out that yarn. Thanks for such a great giveaway! This could be my first lesson in colourwork if I win! Would love to work with this yarn! The first sweater I knit (almost 35 years ago) was an Icelandic yoked sweater. I would love to do another. I hope I am picked! Istex Plötulopi looks like it comes in a wonderful range colors! I have never done a yoked sweater, this would be perfect! This is a lovely design. I have never used this yarn for a project. I’m intrigued by the plutolopi yarn! Would love to knit with it! Seeing as Glasgow was where I was born and bred, I would love to have the chance to knit Glaswegian in its intended colour and yarn! I love that sweater and am intrigued by the yarn. Thank you -so- much for the giveaway! Gorgeous, gorgeous, gorgeous ❤️ ! Whether I will win the yarn or not, I am going to knit this anyway. However, winning would be splendid….. I am knitting with Lett Lopi quite a lott and I was just contemplating Plotülopi for my next sweater. I am from the Netherlands, is that a problem? I’ve been stalking sweaters with patterned yokes all month, and Glaswegian is one of my top possibilities! Love that little pop of yellow to make the pattern sing. Gorgeous sweater! I love the colors. I have always loved the Icelandic type sweaters but have only made one (I do have one on the needles, but it is coming out too large). Both the one sweater I made eons ago and the one on the needles are pullovers. A cardi would be such a “go-to” sweater! Another fan of the colors here. And, I need a fast knit for fall. That, or I need to get to work on all the sweater repair I should be doing. Glaswegian is gorgeous! I can’t wait to work on it! That is a beautiful cardigan, I’d love to make it! That’s the first pattern that caught my eye when I looked at the new issue. How soft and light the yarn looks. What a beautiful sweater! I have been thinking about trying something in an Icelandic yarn for a while. This could be just the thing! My local store recently stopped carrying lopi so this would be a great win for me. aaah it’s so pretty!! looks soft, too! 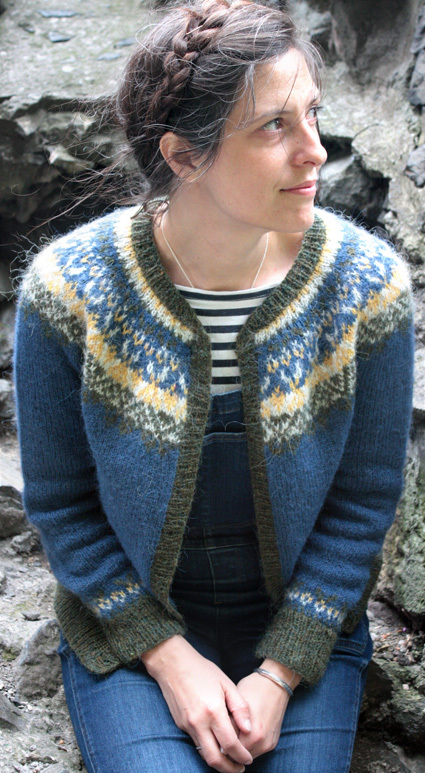 Have always had an an ambition to knit a Icelandic yoke, and would love to try steeking as well. Would very much appreciate this wool! I would love to knit this sweater! I love all of Amy Christoffers’ designs! Thanks for the giveaway! Oh I’ve wanted to try knitting with Plotulopi!! Not Scottish but would love to try the Glaswegian – gorgeous pattern. I’ve wanted to knit a lopi for some time now but have had a hard time finding authentic yarn that’s both soft, budget friendly, and available to the United states so even if I don’t win thanks for the link to this yarn! I love the patterned yokes, and they never go out of style. This is a lovely pattern, thanks for the giveaway. KittenWhiplash on rav. Oh my goodness I love this pattern so much! And I love Plotulopi so much!!! It’s such a fun beautiful yarn to work with! Yay Berrocco and Knitty for an amazing giveaway! I would love to knit that. It’s absolutely beautiful. Beautiful pattern and the yarn looks lovely. I’ve knit with lett lopi, and I would love to try out knitting with Plotulopi! A great sweater to knit as well. Wow what a beautiful sweater! I would love to win this! Thanks for the great giveaway! I’ve tried this yarn and love it, even if it is a bit delegate. Excited for the chance to win some. I knitted a similar sweater for my boy friend, now my dh, but fortunately, I am a better knitter now, so I would like to win the yarn to knit myself that gorgeous cardigan. If I don’t win, I will buy the yarn and knit, so there! But it would be so nice to win. I’m excited for a chance to win the yarn to make this lovely cardigan. I’m also nervous about being chosen, as I’m not sure I have the knowledge to answer the skill question. I’d hate to lose from simple ignorance. There’s so much to learn. Fantastic Sweater – Generous Giveaway! I’d like an Icelandic sweater. Ooh, I just came across that sweater on my recent ravelry search! That’d be perfect for the mild/damp winter here. I queued this right away. Thanks for the contest! This sweater is gorgeous! Thank you for the chance to win! I keep wondering how I can get my husband to take a vacation in Iceland so I can collect all sorts of Icelandic yarns. What a fun giveaway, and a beautiful project. What a beautiful sweater, I would love to knit it. Thanks for the giveaway. Love this, count me in! Thank you so-much for the giveaway! Lovely pattern. Such a beautiful and cozy looking sweater. Good luck to everyone! My wife would love me to knit this for her! The whole issue was really nice! (Can’t wait to cast on Lesula!) But this card I was another standout for me. What a pretty sweater and I really like the colors used. This looks so light and yet so cozy! Gorgeous, that would be a wonderful addition to my wardrobe. Oh, what a lovely sweater! I had a similar one in neutrals years ago, and I loved it! Thank you for the chance to win the kit! I love the classic styling of this sweater and the attractive no-button front edging. I’d love to win this yarn!! What a fabulous giveaway! Just seeing the sweater is making me finish my WIP so I’ll be ready to knit it. That cardigan went straight into my favourites! I love a fair isle yoke. I’d love to win the yarn, thanks for the chance! I live in that kind of cardigan all winter, and winters are long here! As I have one such super-light-yet-super-warm cardigan that has started to develop holes, getting the yarn to make a new one following this lovely pattern would be awesome! I have been wanting to use the Plutolopi for a while – this sweater is a great reason to try it out! The cardigan looks amazing and perfect for knitting during my last 6 months of my PhD in Glasgow, very apt! Yes, Please! What a beautiful sweater! Oh! I’d love to win this! I know I would love that sweater because I had a commercial one that accidentally got felted. It’s about time I replaced it. One of my goals for this year was to try out colour knitting. This would be a great place to start! That would be fun to knit, especially since my grandfather was born outside Glasgow! Whether or not I win, that pattern is going into my queue. A fun knit with beautiful yarn. I’d love to give it a try! Sweet cardigan. Would love to participate in the chance to win the yarn to knit it! Such a lovely design. Strong contender for this winters never-taking-it-off sweater! Oh how I love plotulopi! I’d love to make this sweater! Thank you for the opportunity to win this yarn. I just LOVE this sweater! Absolutely Beautiful!!! If I won, I would actually make this sweater! This looks gorgeous! Do want! It looks like such a fun knit! I’ve been wanting to try this type of color work and a yarn prize would be the perfect motivator. Perfect for our less-than-brutal winters here in the middle of the country! The only thing better than winning Plötulopi would be going to Iceland to get some from the source! How beautiful. It would be perfect for fall winter and spring here in NM. Good grief, that sweater is gorgeous. Please do enter me in the giveaway! This yarn intrigues me. I’ve never knit with something so loosely spun. Great pattern, too! I have thought about doing a sweater like this – and I love, love, love these colors! Me, please! I’ve been intimidated by color matching choices and stranded color work. This would help me tackle both in one project! That’s simply lovely! Thanks for the giveaway! This is one sweater I would love to knit in the yarn it calls for. A lovely gift to win. I love how that blue works with denim. A lightweight Lopi…who knew there was such a thing?! What a nice give away prize! I’ve hesitated to start anything as complex looking as this sweater – but winning the kit will certainly push me over _that_ edge! What a gorgeous sweater! I also love that the photos were taken (and published) sans buttons–this is how real knitters operate! I keep hearing about plutopi and am curious to try it out! This would give me a good excuse to learn how to knit with two colors at the same time! Very pretty sweater. Wow! Yarn that is lighter than air! I’d love to have it. Live the pattern, love the colors. The pattern is gorgeous! I would put aside all my other projects to begin it. Lovely yarn and a beautiful pattern! That sweater is flat-out gorgeous. As for the plotulopi…I kit a lace shawl with it once, and the result was *amazing*. Super light AND crazy warm! This is a lovely pattern — thanks for the chance to win the yarn! That’s a gorgeous sweater and I’ve been wanting to try plötulopi! Thanks for such a cool opportunity! Love, love, love the cardigan!!!!!!! Thank you for the giveaway! What a beautiful sweater and what a great giveaway! Beautiful sweater, can’t wait to make one! What a lovely pattern! I would love a chance at this. I would love to win this prize! The pattern and yarn are both wonderful. What a great giveaway! It’s a beautiful pattern, plus Icelandic wool is like magic. I’d love to give plutolopi a try. That’s a beautiful sweater, and those are my favorite colors! I’ve never made a stranded sweater like this before. Its so pretty, though. Oh my goodness, I would love to make this sweater in this yarn!! Fingers crossed!!! Beautiful sweater. Oh, how I’d love to knit this for myself! Steeking and colorwork are one area in which I would love to grow and this looks like just the sweater to start playing with techniques. Love this sweater and would love to win the kit! Actually knitting a sweater is on my list. I keep not buying a new one because I feel like I should knit it myself! This one would do! Never attempted anything like this, but it looks oh so beautiful I’d certainly give it a try. Would love to do more color work hope I win. Thanks, Berroco. This would be a wonderful prize to win! I am just finishing the Laurel cardigan, which I love. This would make a perfect gift for my soon-to-be eighteen year old niece. It is gorgeous…even without buttons! This looks like a wonderful sweater to cozy up in on a cold winter evening. I love the color combination. Looks like a fabulous yarn! Saw this yarn on Berroco site and thought, “I want that!” Thanks! What a gorgeous cardigan – love that the yellow has been incorporated. I would really, really like to knit this sweater. Beautiful sweater! Love the pattern. Would love to knit it!! I’ve been wanting to make a lopi sweater for awhile! I’d love to try a sweater in this yarn. So beautiful! This caught my eye as soon as I saw the new Knitty! I’ve been wanting to try a yoked sweater for a while. A beautiful fall knitting project! A beautiful fall sweater! Scrumptious colours. Beautiful sweater ! Looks like a great squishy, “yummy” yarn to try . Gorgeous sweater! Love the color combination….it would be a fabulous project! Looks like the perfect fall knit. Dare I wish? It’s so pretty! I can’t wait for sweaters all the time weather. I once knit a sweater that was supposed to be made of lopi yarn out of something else – it was TOOO heavy. What a nice give-away! It is such a beautiful sweater! I would love to knit this sweater. This is such a lovely cardigan! this pattern reminds me of my Scots grandmother! I have not knitted a garment since the 80’s. This looks like it wiuld be fun. Please pick me. I remember reading a blog post about this trip and am so excited to see the sweater pattern! I bookmarked this sweater the minute I saw it the other day. What a beauty! Love this design — such a wearable sweater! And I’ve never knit in the plotulopi, though I love lopi. Love the colors!! Have never tried to knit Icelandic styles yet but think I’d be ready with this one. It’s beautiful!! I can’t wait to make this sweater! That’s a beautiful sweater, and I’d love to make it! How delectable! Lovely sweater and lovely yarn = win win! Thank you for the giveaway. This looks so soft and wooly! Thanks for the beautiful patterns Knitty! …all we need is one perfect, beautiful thing..
That’s such a Beautiful Cardigan! Winning this would definitely give me the kick in the pants I need to finish my Afmaeli sweater. It’s in my queue – the kit would be perfect! I have been looking for a colorwork cardigan to make! This would be perfect! I can always tell when the year is heading into fall – even if it’s August – because I start getting the urge to knit cables and cozy sweaters with colorwork yokes. And then Knitty presents me with a gorgeous design, and even better, the chance to win the yarn to make it with! I would love to be able to make this! This is a beautiful cardigan. I can see it as a staple in my wardrobe. I would love to be able to work with this yarn! Love this sweater! I haven’t knit a sweater in almost 10 years ~ but seeing this one I’m in! Skill question – just a beginner but I will try! What a beautiful sweater for these fall days. I’d love to make this one! Beautiful cardigan. Such a beautiful sweater. Thanks for the giveaway! Gasp. I’ve been dying to knit a sweater in the Norwegian/Icelandic style. This is the giveaway of my dreams. What fun and such beautiful colors. OH MY GOD yes. Such a beautiful pattern for such delicious yarn. Sweater looks cozy. Love the colorwork on the yoke. The yarn looks so fuzzy & scrump! This is just what I need to get me on the needles. Beautiful sweater and such a generous give-away. Thanks! This was on my to make list. A kit would ensure it happens! I LOVE plotolopi. I would start this sweater immediately. Gorgeous cardigan! Perfect for the upcoming season. I have always wanted to make a sweater like that. It’s beautiful. What an awesome giveaway!! Gorgeous cardigan! What a pretty sweater. Maybe it’s time to finally buckle down and knit my first adult sweater for myself – have knit lots of accessories but only kid-size sweaters so far. Oh! That’s beautiful! Thanks for the chance to dream! Oh my goodness, i would love to win the yarn to make this! That’s a gorgeous cardi, I definitely need one! Beautiful sweater! would love to be the winner! Glaswegian certainly IS beautiful, I have my fingers crossed really tight! Well, it’s still in the high 80s here in the US south, but I’d love to start this, so that I could wear it when (if?) it ever gets cool. I adore the colors! Plötulopi is such a fun yarn! I love this sweater, and though I’ve worked with lopi and litelopi, I haven’t ever had plutolopi and have always wanted to try it! oh so cozy and pretty!! yummy. I’m ready to knit my first Icelandic sweater with plutolopi. Yay! Thanks for the contest, Knitty and Berroco! I put this cardi in my queue as soon as I saw it. Love! Thanks for the contest! Just my colours! And a good excuse to go to Glasgow to show it off! I’ve never used an unspun yarn like Plötulopi. IT’S TIME! The Glaswegian is a perfect reason to try. I am SO excited that plotulopi is coming to the US at long last! I have friends on a lopi knitting group on Ravelry who make gorgeous creations from this mysterious wispy stuff. Can’t wait to try it! What a beautiful design! I’d love to knit this. This is such a gorgeous sweater and I can’t wait to knit it up. My daughter just came back from a trip to Glasgow and somehow it just seems fitting to knit us both sweaters. Thanks for the opportunity to win. I saw this type of sweater while i was in Iceland. The were pretty pricy but beautiful. I would love to replicate it by making one myself. Thanks for the chance. I love Lopi. Thank you for the chance to win. long time since I knit a LOPI. Beautiful sweater, I would love to test my knitting skills on something like this. Gorgeous sweater! Whether I win or not, this is going to be a surprise gift for my daughter. I fell in love with this sweater the minute I saw it. Would love to win this kit. What a beautiful sweater. i’d love to make it. Gorgeous! I’d love to knit this as a gift! That is a lovely sweater and generous gift. Thank you for chance to make my own. This would be an intriguing and beautiful project. A beautiful sweater! I would love to try knitting with this yarn. Thank you for the wonderful give away. This is so pretty! My granddaughter would look fabulous in it, and this Nana would love to make it for her. I’ve been wanting to knit with this yarn for a while now, and this cardigan seems a perfect place to start! Such a beautiful sweater ! I had a commercial one like that and my husband got so tired of seeing me in it, he actually expressed it so. I love wearing cardigans . Would love to make this sweater! Just beautiful! It is so funny how things come and go…when I learned to knit (37 years ago) I knit a Lopi sweater (pullover). It really taught me a lot about knitting … sleeves, knitting in the round, intarsia…so happy to see these sweaters making a resurgence! Lovely sweater. Thanks for the chance to win the yarn. Such a lovely sweater & the yarn sounds divine. I’d love to knit this one. I have some of the Plotulopi and absolutely love it. More please. I’m ready to do a steeked sweater and this one looks lovely! I have made one Lett-Lopi Icelandic sweater and am working on a second. I haven’t tried Plotulopi yet but would love to make the Glaswegian cardigan with it! Oh My! That sweater is wonderful, It would truly be a piece that I would take my time in knitting. Enjoying every knit and purl. Oooo, now I am ready to try color work! Beautiful sweater, and it looks cozy, too. Such a beautiful sweater; I will make it one way or another! What a beautiful and practical design. Great color work project. Love lopi. Love these colors. And especially love the 5-ish stitches, which would make this project go super fast! I love these colours! I’ve always loved these sweaters but have never taken the time to make one for myself. Thus is definitely one I would love to have for me. Yes please! Thank you for this opportunity! What a beautiful sweater! I’d love a chance to win. Thanks! This sweater is lovely! What a beautiful gift this will be for the lucky winner! Fingers crossed!! I would love to learn a new technique! Thank you for this opportunity. The sweater is beautiful. This would be a lovely kit to win, knit, and wear!! It’s a beautiful sweater, and I’d love a chance to make it! It’s a beutiful sweater, and I’m going to make it whether I win or not. I hope I win, though. This is a very nice sweater. What a beautiful sweater! I’ve recently decided I want to knit more multiple colour sweaters. I’d love a chance to try this one out! What a beautiful sweater. The yarn looks divine. I would love to win this. Wow what a beautiful sweater! Oh!! Isn’t that just the most lovely cardigan. The yarn looks fabulous and I really love the colours. It’s a gorgeous sweater, and a yarn I’ve been wanting to try. It looks so warm! I’ve never knit something this complicated before but it’s so beautiful I’m excited to try! Beautiful – one of my faves from Deep Fall! This sweater is beautiful! I’m adding it to my list of favorites on Rav. The sweater is stunning. I have been wanting to make a yoked sweater for a long time…even if I could only wear it twice a year in NC. A beautiful sweater! A new challenge. This is a beautiful sweater. Thanks so much for a great giveaway! Blue is my go to color. I love everything about it. I would love a chance to win it. I love Lopi so much. I have some plotulopi and I decided to see if I could knit using a single strand (actually making a swatch). Half way through knitting the swatch I I found Glaswegian! Wow! A great pattern and what great timing. My fingers are itching to start knitting this gorgeous color work cardigan! Dang, that’s a great sweater! Not sure my skills are up to it, but it’s lovely! A beautiful sweater and a beautiful yarn! Thanks for the chance to win. Absolutely Love it! This is my favorite yarn and type of Sweater to make! Even if I don’t win I know I will knit this! Plotulopi would be fun to try out and the sweater is just gorgeous. Just stunning yarn & pattern. Beautiful pattern, lovely colors, gorgeous yarns – sure would love to win this! Beautiful! It’s in my queue even if I don’t win the kit. Beautiful sweater! I would wear it every day! My fingers are itching to play with that yarn! Beautiful sweater. I would love to give this yarn a try. Any sweater made with Lopi is WONDERFUL!!!! This is a pretty design too. What a beautiful sweater! I love the colours and the fair isle design. The sweater is perfect for all-year wearing. Thank you! What a gorgeous pattern and yarn! This sweater reminds me of the ones that were popular in the 80s, when I was in high school! I’d love to make one for the memories and to wear!! Love your color choices here. Can’t think of a way to improve on those. I have made several Lopi sweaters with Lettlopi and would to try Plötulopi! Fingers crossed! After just returning from a 2 week trip to Europe, I would be so excited to knit this!!! The perfect sweater for keeping me warm on these autumn days!!! The perfect sweater for these cold autumn days! I love Icelandic wool. Still my favorite sweater to wear skiing is the one I made in 1976. This looks like a lovely sweater and beautiful yarn. I’ve never knit with brand before. It would be beautiful on my daughter. I’d love to work with Plötulopi, and the pattern looks great! This is a perfect sweater. I’d enjoy making one! Stunning! I would wear this every day, all winter. I love colorwork sweaters, and this one is another beaut. I love knitting and would love to knit a sweater with this beautiful yarn. Thanks for the chance to win. The colors used and pattern make this lovely. Thank you for the giveaway! WOW! This sweater is amazing. This sweater is an excellent candidate for the wooden toggles from the button collection I inherited from my grandma! I have wanted to make an Icelandic sweater for awhile now. Maybe this one for my daughter. Lovely colors! Beautiful sweater- I would love to have the opportunity to knit with this yarn! I love this sweate! I would love the chance to develop my stranded colorwork skills. Thanks for the opportunity. I’ve been interested in getting into colorwork for a while. This one does it beautifully. I like how the design flows between the colors. I love this style of colorwork, I’d love to try it myself! Love the pattern and colorway! Beautiful! Would love to make this! Oh that would be so much fun to make ! Love the colors. I’ve been itching to knit myself a lopi sweater. Thanks for the opportunity. That looks so very cozy. Gorgeous! Can’t wait to try this yarn! Uau! It would be fantastic to be able to use this yarn! I’ve been trying to decide on a sweater to start on now that the weather’s getting cooler, but haven’t been able to settle on anything. Until now—I think this is the winner! I would love to give this yarn a try, especially in conjunction with this wonderful cardigan design! Looks lovely, count me in! I’d love to try this lopi, and Amy C designs are always super. I’ve made quite a few! I love the idea of a sweater as light as air! I’m intrigued by the yarn and the design. I grew up wearing colour work sweaters and would love to make this! this is so beautiful! pick me! This is gorgeous! Would love to knit this cardigan! Hope I win! Fingers crossed! I love this pattern! The design, colors and a cardigan! I am a big fan of Berroco yarns but haven’t tried this one yet. My very first colorwork project was a hat knit out of plötulopi. It’s a little fiddly to work with because it’s unspun, but the finished fabric is lovely. I lightly felted the finished hat and it’s impressively water resistant. Beautiful sweater. What a treat to knit. What a great combination of pattern and color! Plus I have been wanting to try knitting with lopi yarn. The lopi wools sound fascinating, would love to try this! I’m not sure if I’ve ever knit anything with an unspun roving-type yarn. I’ve always thought it sounds like it would make for a fantastic sweater, and I’d love to give it a try! Lovely! I would love to knit and wear this sweater. My first knitting project was a sweater with chunky Icelandic wool. 3 weeks knitting (over a spring vacation in college) and it was done. People still laugh when I wear it. This is so much more sophisticated! Such a gorgeous sweater! I’ve been wanting to try out this yarn for a while. So beautiful.. would live to knit this! Oh wow! I’ve never knit with this yarn, and would love to try it out. Wow thanks for another amazing contest! Thank you for the opportunity to win! The sweater is gorgeous. Lovely sweater. If I don’t win, I may have to buy this kit! I would love to try .